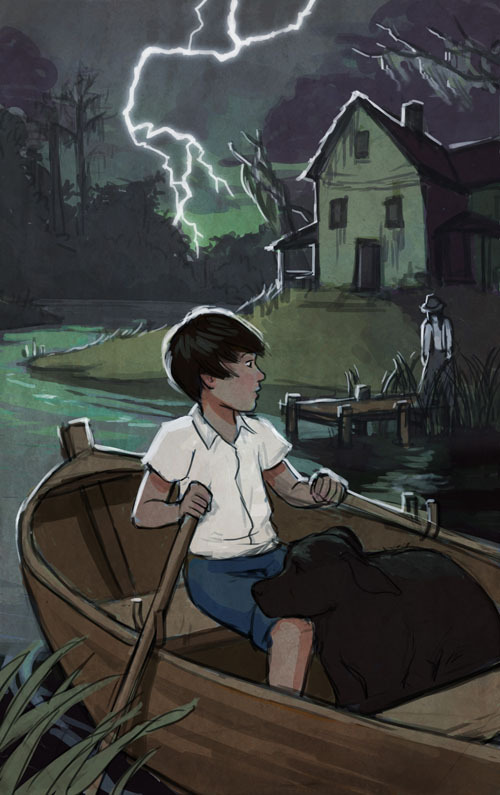 This is the second book cover I created for the series of middle-grade books called Blackwater Novels. (You can read about my first cover for the series here.) The series is set in the south during the 1930's. 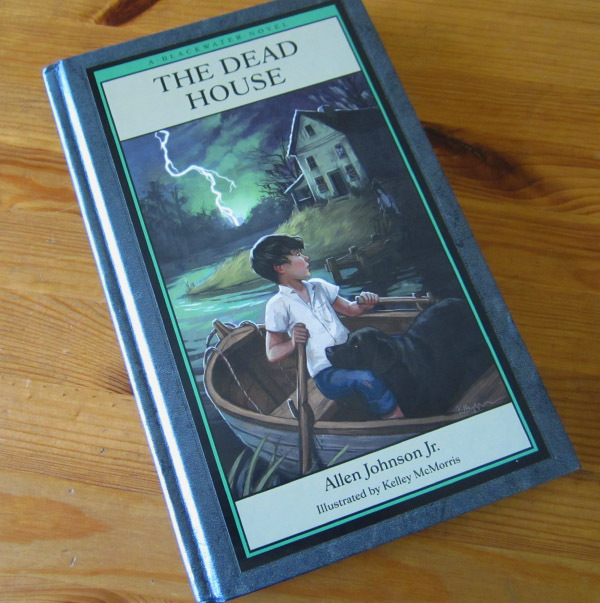 In The Dead House, Rad lives a mostly carefree life of fishing, camping, and comic books - but the abandoned house downriver has been giving him strange nightmares. 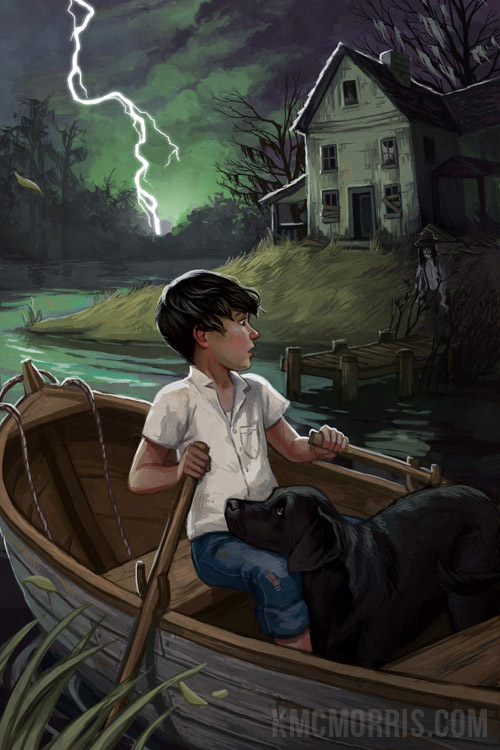 Allen then clarified that he wanted to depict a specific scene from The Dead House, where Rad is rowing down the river, with his frightened dog, during a thunderstorm, looking back over his shoulder, and by lightning-light just catching a glimpse of a ghost who is standing on the dock, partially obscured by shrubbery. Did you get all that? Rowing. Looking over shoulder. Frightened dog. Haunted house. Thunderstorm. Swamp. Lightning striking into swamp. Ghost. Dock. Shrubbery. For a while I rocked myself back and forth in a corner of my room while I wondered how I was going to come up with a composition that could fit in all these elements. An additional challenge was keeping the black labrador from disappearing in a scene that was necessarily very dark. 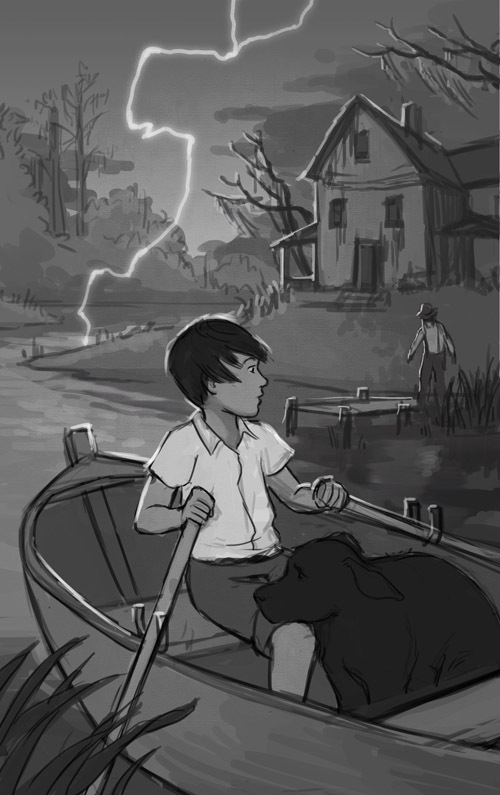 I also struggled with establishing the boy as the focal point of the scene, when Allen emphasized that he wanted a very strong single lightning bolt in the sky - and huge lightning bolts tend to kind of steal the show, you know? 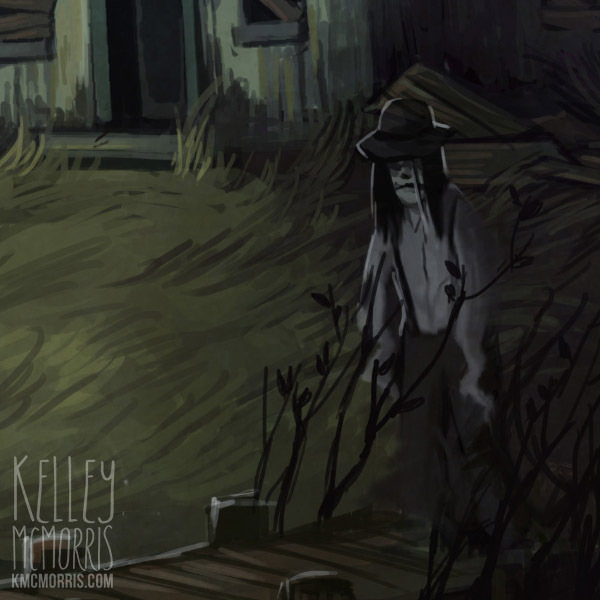 In order to enhance the creepy mood, I went with a green-and-purple color scheme. Check out that shameless use of rim lighting! 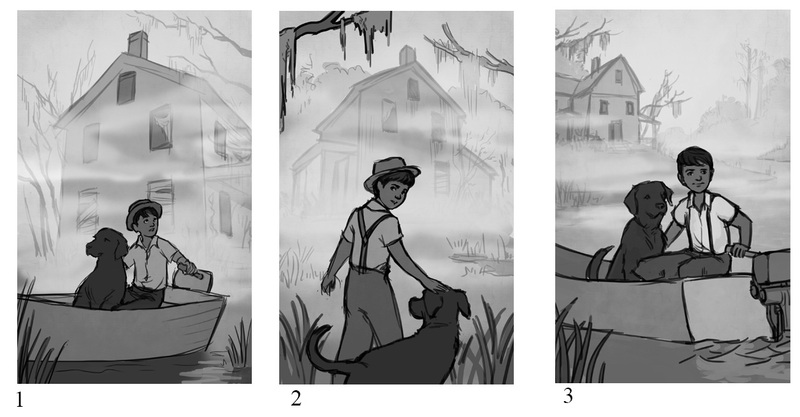 Another challenge - haunted houses, swamps and boats all tend to have muted, grey colors. However, middle-grade book covers need to be colorful. 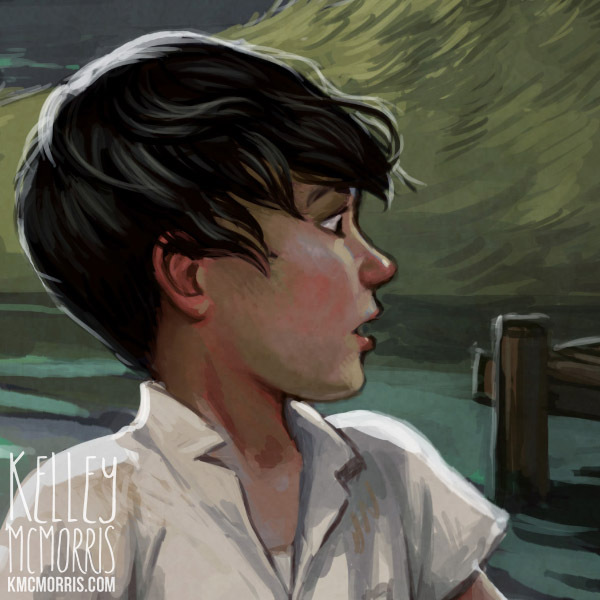 So I relied a lot on an unnaturally saturated sky and lots of pink tones in the boy's skin to bring some color into the piece. As difficult as this was, it turned out to be one of my favorite illustrations that I've ever done. I suppose there's something to be said for pushing yourself out of your comfort zone, even if it does mean a little time spent in a corner rocking yourself back and forth. There are also 28 black-and-white chapter illustrations inside the book. If you're interested in purchasing a copy of The Dead House, visit the Blackwater Novels website. (I do not receive any royalties from sales of the book.) You can also purchase a print at my Inprnt shop. Ah, authors. I'm no stranger to commissioners having clear ideas about what they want but refusing to divulge this at the start ('do whatever you like' is actually my least-favourite instruction! I don't like it, and I don't trust it!) or briefs that involve a huge amount of stuff happening but don't involve actual room for all these things. Such things are good for us, though, I'm sure. ^.^ I tend to freak out, and then come up with a solution either in the shower or while walking my dog... if I don't, I start to panic a bit! Pushing yourself out of your comfort zone was definitely a win here, it looks fabulous and so atmospheric with all that moody lighting. I love his expression and windswept hair (and the dog)! I'm glad to know that I'm not the only one who comes up with my best ideas while doing something other than drawing. These days it seems like a luxury to have the time to just let an idea incubate in my mind, though. I agree, there's a balance between too much art direction (draw all the things!) and "just draw something cool." I've wanted to write a blog post about it but I have a hard time finding the words to define it clearly. I think there's something about staring at a piece of paper or a screen that just compounds the fact that the ideas aren't materialising. I also like to needle felt when I'm stumped, there's something meditative about it that can help free up the subconscious. I think the ideal clients are the ones who know what they want, but are open to suggestions on how to improve it – but how often do we get those? =P I recently did some wedding invitations where I was told to 'do whatever, don't bother me with it', which was hard. All I had was the colour scheme to go on. And at the same time I had another wedding client who knew what she wanted, but if I could come up with something that worked better, she was always open to suggestions. There was quite a contrast! Great stuff! I think you nailed it, given the challenges of the author's direction.